Upaya Social Ventures is proud to announce that it has received a grant from the Open Road Alliance for the creation of an online platform that will be used by Upaya partners to collect and analyze data about the progress made out of poverty by their employees. This data will not only give Upaya’s partners critical business intelligence about the state of their workforce, but it will also allow them to quantify their social impact to prospective follow-on funders. Through this system Upaya will also have the ability to aggregate data across partners, strengthening both the organization’s understanding of the key indicators of ultra poverty and its ability to identify trends among households benefiting from increased income stability. Open Road provides fast funding for non-profits either to overcome unexpected obstacles that imperil an on-going project or to grow substantially with a one-time, targeted grant. This grant fits within the latter category as Open Road feels that an online platform for collecting and analyzing social metrics will significantly expand Upaya’s capacity to create employment. 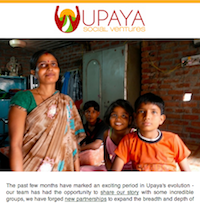 “Measuring social performance has been a part of Upaya’s DNA from the very beginning, and this system will empower our partners to maximize their potential,” said Upaya’s Executive Director Sachi Shenoy.